You are currently browsing the Archaeofacts.com archives of Musings for the day Saturday, January 2nd, 2010. 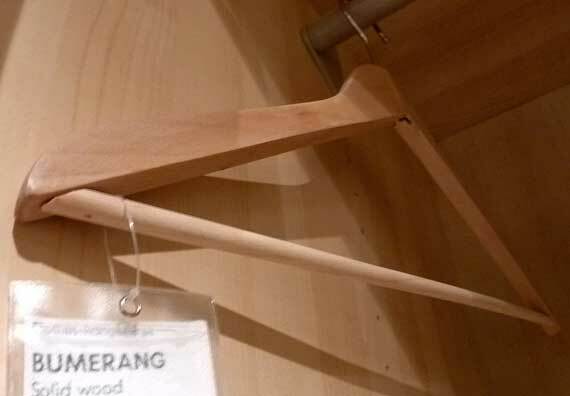 Yeah, that says BUMERANG. Get one and watch that it doesn’t clip your chin when you nab your jacket! Crazy idea to visit IKEA today. The parking lot was packed. The aisles were packed. Saw no excessive grumpiness, however—oh, happy day! Still, we escaped with our usual: candles and party napkins. Plus two picture frames and incredibly inexpensive steak knives (like we have steak very often! ha!). Since KW and GG have been talking kitchen plans, I’ve been thinking ours needs help; liked some of the real wood door/drawer fronts* I saw.